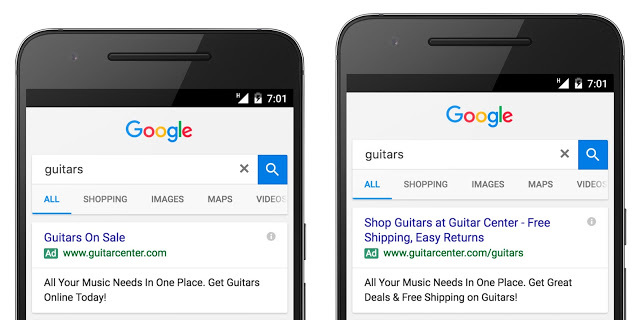 Having been teased at the Google Performance Summit back in May, Google have officially launched the ’Expanded Text Ad’s’ ad extension in Adwords. If your not already using Ad Extensions in Adwords, you really should be and this is a great opportunity to be one of the early adaptors for this new extension. The new Expanded Text Ad’s give you the option to have 2 headlines, each with 30 characters each and a description line of 80 characters. Having these extra characters available to you, makes it easy to run A/B tests using Standard and Expanded Text Ads to gather data about which format converts better for you. It’s a great idea to take advantage of this new Adwords extension, before it’s common knowledge outside the paid search community. You can get your Expanded Text Ads up and running before your competitors are likely even aware of it and give your adverts a real point of difference and potentially higher CTRs. Also don’t forget, Google loves you to use Ad Extensions, the better the advert and more extensions you use, the higher the quality score, which can save you money where it really matters.